Restaurant "Oseleta" - Villa Cordevigo | nr. 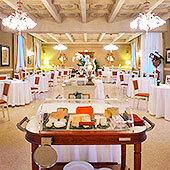 Lake Garda, Northern Italy - GourmetVoyageurs.com food and travel for discerning palettes. Under the capable hands of one Michelin starred executive Chef Giuseppe d'Aquino, this eatery is the main reason to come and stay at Villa Cordevigo. The cuisine is superb Italian food rendered with all the modern flair of a fine chef with years of experience in Italy and France while not loosing track of its roots in flavor and ingredients from the local soil and micro climate. This chef has a joy of his kitchen, not squelched by the rigors of attaining a Michelin star. 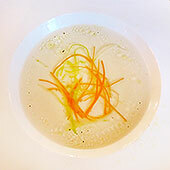 Chef Giuseppe D’Aquino enriched his cuisine working in London, Paris, Los Angeles and Dubai. His love of the local Italian ingredients and the wonderful choices throughout Italy brought him home and today he combines his extensive travel and the culinary influences he enjoyed into making his renditions of Italian cuisine a marvel. This is no fusion cuisine, just really fine Italian enriched with a broad knowledge and experience from all over the culinary world. His quality was recognized in 2013 by the Michelin Guide with his first star - justly deserved in our opinion. He is one of those chefs who loves to talk about his favorite passion - cooking and his second favorite (or that may be in doubt) his love of foot ball. He has a demonstration kitchen in the main hotel structure where he teaches cooking classes and worked with us on several recipe demonstration videos. The first streaming in spring 2015 where he demonstrates the "Amberjack Carpaccio" dish that Peter subsequently had the pleasure of eating down to the glaze on the plate that evening. This was followed for me by an "Orata" (a white fish) dish served on top of a bed of steamed cauliflower and carrots with local olive oil. Peter enjoyed his Sea Bass with a sea foam topping and mussels and stewed sun dried tomatoes in a garlic sauce. Local cheeses came next followed by a simple and delicious lemon sorbet for myself and an extravaganza "bomb" dessert for Peter. This consisted of a pool ball sized golden sugar "ball" filled with whipped cream, nugget of chocolate sorbet and sitting in a pool of chocolate sauce. Dinner was followed by a stroll around the grounds of hotel Villa Cordevigo lit by the last of twilight with the pink in the sky reflected in the glassy calm of the pool. 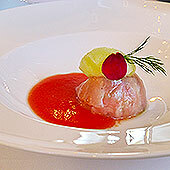 Some of the uniquely Italian products that feature in his cuisine are the tomato sauces made from the "cherry" or "grape" tomatoes from Campania that features on the "Amberjack Carpaccio" video which have a special rich taste. He has very specific ideas on just how to prepare risotto that will feature on an upcoming video that shows you how he does it. High quality beef make his Garronese Veneta Tartare special as do Cetara anchovies and of course the huge variety of tastes and styles of true Italian olive oils.